I have a confession to make....even though I am a proud feminist and lifelong believer and supporter in the fact that women can do anything men can do, I have some pretty outdated and unfeminist-like habits. It seems that Tim and I have fallen into some pretty gender traditional stereotypes at home and I don't know how it happened. Maybe it's because I have been a stay-at-home mother for over a decade and proudly taken care of our home and our kids and made it easier for my husband to go for the jobs and stay late at work and all that. And I've been happy. But somewhere along the way, I came to believe that some jobs around the house were more for Tim, more manly. Jobs like grilling or using power tools and saws. How did this happen? Well, in the last couple of weeks I have reclaimed some of my power and I'm loving it. 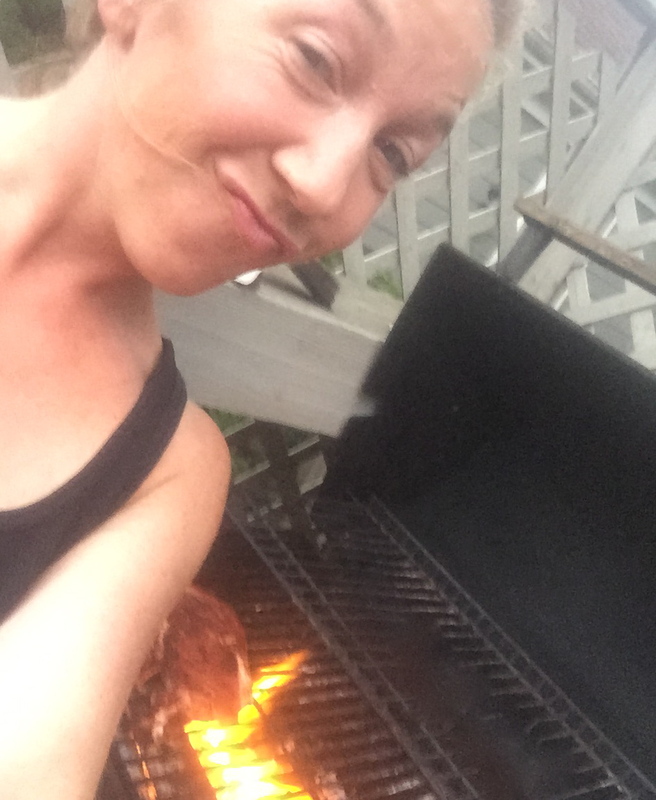 Not the most flattering selfie, but I don't even care because I'm grilling my own steak. I'm 41 and this is the first time I've ever grilled. Whaaaat? But yeah, I'm the griller in the house now. Boosh! Since Tim works a lot and coaches all of our kids' everything, he's gone a lot and when I want to make a craft or have a steak I can't wait for him to come home and do it. Or when a tree comes down in the backyard after a rather windy night, someone needs to take care of it, me. 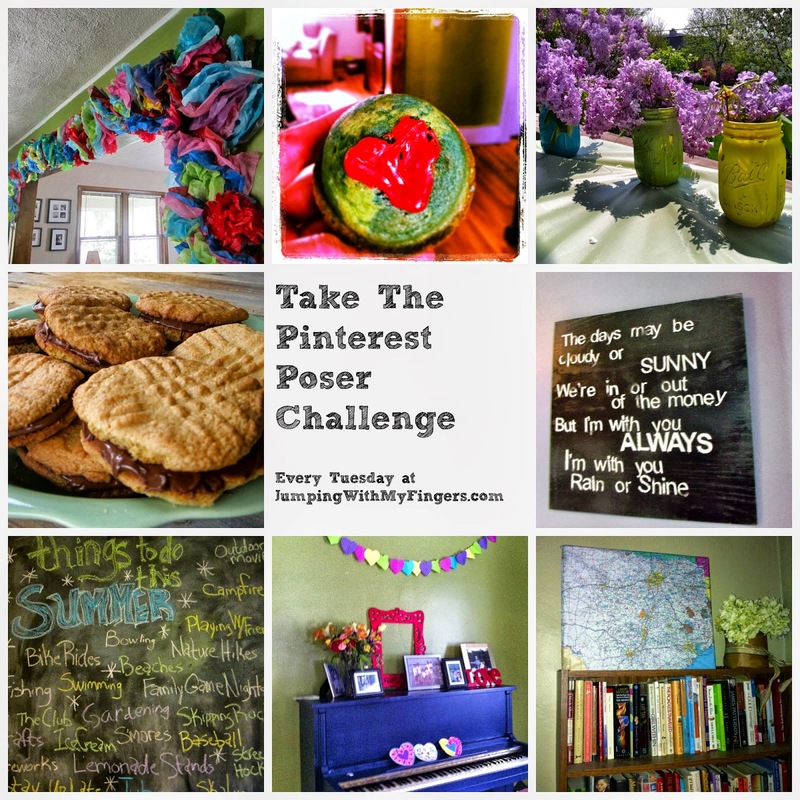 This week's Pinterest Poser Challenge* is a very special episode sort of like the funny sitcom that deals with a certain serious topic. This week is about challenging gender stereotypes while crafting and cooking and generally taking care of business. Two weeks ago, I used my first power tool and well, there's no turning back now. 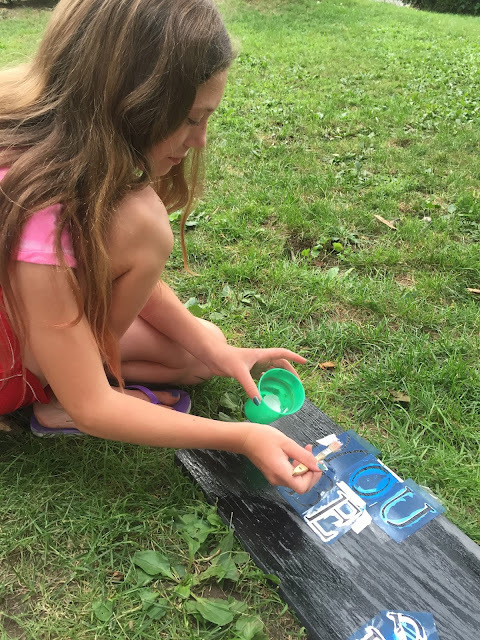 I wanted to make a sign out of an old piece of wood for the back porch, but the piece of wood was way to long. So I found the power saw and after a few tries figured it out and cut the piece of wood. Honestly, I was sort of afraid at first. But then loved it. I felt powerful. This project was inspired by a million I've seen on Pinterest and wanted to copy/make. I had already spray painted the wood with a couple coats of black paint. And taped stencil letters for the quote I wanted and painted over them with white paint. After I cut the wood, I spray painted the end and set it on my back porch. The quote is from my favorite, but quite unpopular, movie from the 1980s "The Allnighter." I 've mentioned the movie quote before because I love it so much. 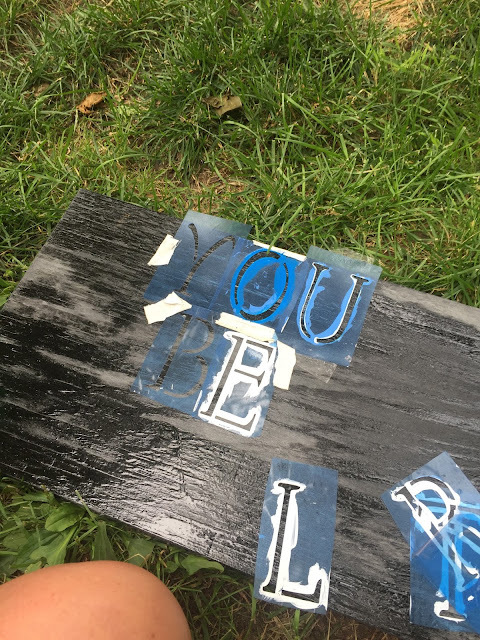 The movie starred Susanna Hoffs (I think that was the only movie that starred Susanna Hoffs) and in it a Cali surfer dude gives the stellar advice that I carried with me into high school and adulthood--"You be you." Love it. Inspired by grilling and sawing, I wasn't done feeling the power. I decided to use an intimidating tool for a project I've wanted to do for over 15 years. I inherited a great table when I got my first house in the winter of 2000. It is my ex-step-mother's parents' table...it's got history and I love that. But I never loved the black paint my dad's former wife used on the table. Back in 1990 she had the wood painted black and the chairs painted black and I hated it. But I loved the table, it had good bones, good history. For the past 15 years, we've added to that history. When we aren't eating on our front porch door table, we have every family meal on this table. It's a good table. With my new found power I decided the wait to take off the paint was over. I used some sort of stripping, heat-inducing, potential fire starting tool that melted the paint as I scraped it off. It was dangerous and awesome. Once again, I felt powerful. I get why Tim Allen made all those grunting sounds in his stand-up routine and on his sitcom. I get it now! Layers of thick black paint on this table. I hate it. I love all the wood furniture on Pinterest and all the refinishing, recovering and reviving tutorials. The table is almost done and I couldn't be happier. The natural wood is beautiful and I can't wait to eat dinner on our new old table. Last week in the middle of me reclaiming my power and fighting gender stereotypes that I created in my own home, a tree blew over in my backyard. It felt like the universe was testing me. Like she was saying "okay lady, let's see if you are a poser." I'm not afraid to tell you I cried a little when I looked outside and saw the tree had fallen. It's okay for strong women, and men, to cry. It is. After a few tears and a few calls to the power company, I got to work. The tree trimmers came and took care of the branches on the power lines and left the mess of limbs and branches and stumps for me to clean up. So, I got out a rusty saw I found in the garage and started sawing. I got this. It's going to take a while and I will need to borrow a chainsaw (and um, I can't wait), but I got this. I feel heady with power and like there ain't no stopping me, ain't no mountain high enough, I am woman hear me roar, I've got the power! Ahhhh! And I can't stop talking in song lyrics. But for real, I feel strong and capable and less afraid and it's a good feeling. So here's the what, don't wait, go grab a tool and strip that table, saw that board and go grill and do and make and create and feel your power. Have you made anything inspired by Pinterest lately? 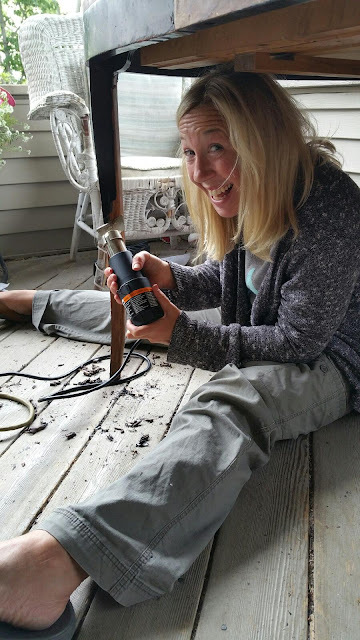 Have a favorite power tool? Let me know in the comments or over on my Facebook page. LOVING the table. There's so much beauty in old furniture. You are AWESOME! Get on with your powerful self. I've never held a power tool in my life. In fact, I've never even touched a glue gun before. You are awesome!